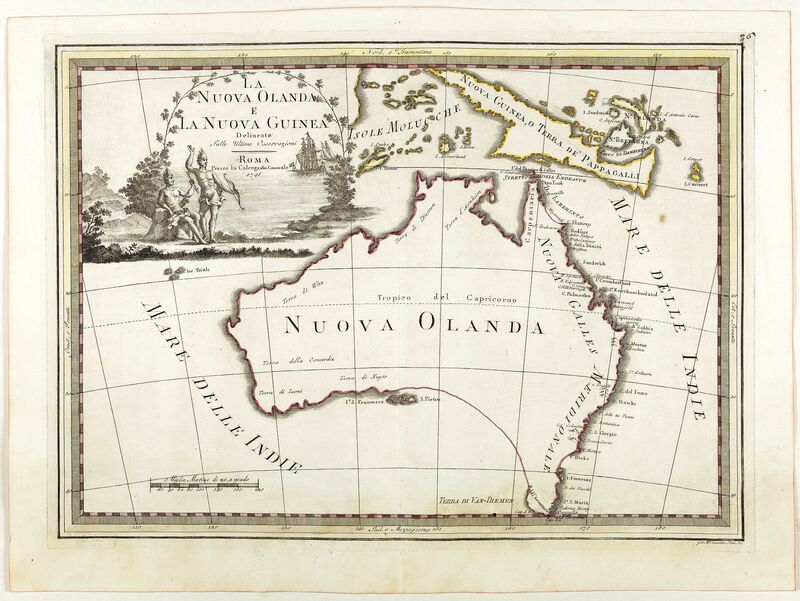 The Italian painter and engraver, Giovanni Maria Cassini, produced this splendid map of as part of his epic three-volume atlas. Published in: Nuovo atlante geografico universale delineato sulle ultime osservazioni. Roma, Calcografia camerale, 1792-1801. Cassini was geographer and cartographer but he was also good at engraving architectural items and perspectives – he was one of the best disciples Giovanni Battista Piranesi had. Moreover, Cassini was one of the last artists to engrave spheres in the XVIII century and his globes were quite famous and widespread, and realized the most important Italian Atlas of the XVIII century; his maps always bear a cartouche, extremely rich in colours and details. Copperplate with fine original hand colour, some foxing, otherwise in very good condition. The Cassini's Atlas was reprinted by the Calcografia Camerale in the first quarter of XIXth century (before 1839). Only the first edition of the atlas is printed on contemporary laid paper, while the late issue are on XIXth century paper.